Our organic urban design proposal rises from questioning the checkerboard as city’s master layout. Inpired by diverse tesselation patterns in nature, we first concieved a generatrix form to our design. Starting from an hexagon set in a golden rectangle, we later escalated to more complex organization levels. To do so, we settled the barycenters of these figures in φ driven layouts. This order takes inspiration in Voronoi’s diagrams, where the plot resulting from joining barycenters of a polygon arrangement describes in a destillate way their relative position. 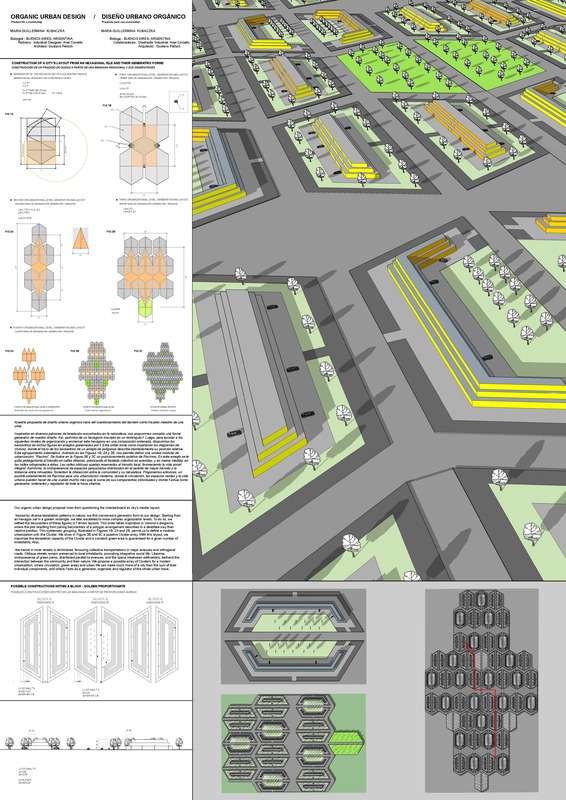 This systematic grouping, illustrated in Figures 1B, 2A and 2B, permit us to define a modular urbanization unit: the Cluster. We show in Figure 3B and 3C a putative Cluster array. With this layout, we maximize the tesselation capacity of the Cluster and a constant green area is guaranteed for a given number of inhabitants. Also, the transit in inner streets is diminished, favouring collective transportations in major avenues and orthogonal roads. Oblique streets remain preserved to local inhabitants, promoting integrative social life. Likewise, omnipresense of green parks, distributed parallel to avenues, and the space inbetween edifications, befriend the interaction between the community and their nature. We propose a possible array of Clusters for a modern urbanization, where circulation, green areas and urban life can make much more of a city than the sum of their individual components, and where φ acts as a generator, organizer and regulator of the whole urban trace.